Up to now, we showed you how to have a pretty solid mechanic, But this game can be fun for only so much time if there is no variety and no depth in it. Lets see how we create gameplay assets for the game. This post is one of my personal favorites as it demonstrates the tests and struggles an idea has to overcome to find its final form in the game. Imagining stuff and putting it into the game, better be some original stuff! In fact, up to now, it has been the most difficult task, not because we lack ideas, but because they must fit and be fun for everyone, from the toto master to the newcomer. Those darned newcomers, always making us twist our ideas like contortionist slinkies so they can be easily assimilated by them. For the toto masters, we could have a bunch and a half of ideas all of them funky as your parents re-enacting Crouching Tiger and Hidden Dragon on your christmas tree, but sadly most of them would turn off neophytes because it would introduce difficulty, confusion and sensations of not being in control of what happens. Let’s peek at the way we challenge our new ideas through the story of a cool new asset in the game: the trapping bubble. It all started with a mine. 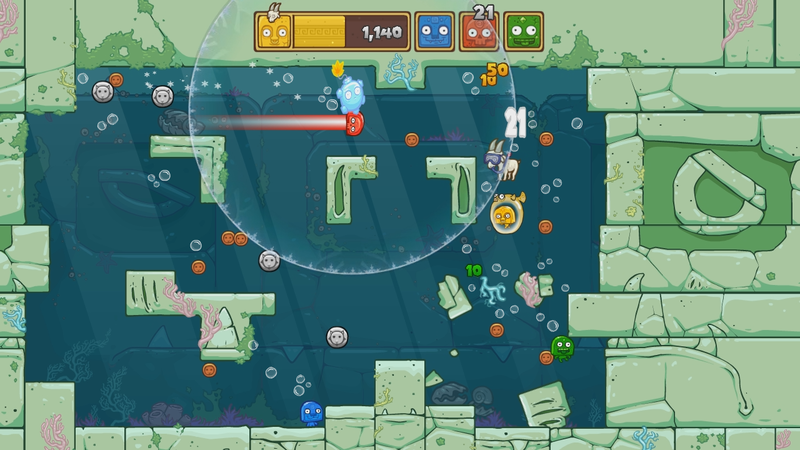 The idea was to introduce a player induced variable in the level design in the form of a powerup, so every time you play a level, it never is the same, the “forbidden” areas are never the same and you must adapt to this, as well as giving depth to the game, by enabling tactical placement and usage for more advanced players. The intentions were noble, but the end result was not exciting enough to warrant the detour, this is when the mine morphed into a ball. This ball would float in the air, and when it is hit by a dashing toto, it would get kicked and be dangerous for a short time, a little like the soccer ball in Super Smash Bros. This alone would certainly still be not enough an advantage as the ball would be difficult to kick in the right direction. So we added a lasting effect: with the 4 first collisions on the walls that the ball does, it creates a static charge (a little electric ball) that crawls along the surface it touches, a little bit like the sparks (the sun type thing) in Super Smash Bros (I think our inspirations are clear to you now). The idea was cool, it still promoted the idea that players would change the layout of a level with a simple input (when a spark would run along a small block, the area would be dangerous), the choices were more obvious (kick the ball, see what it happens), the strategy was still there (try to stay near your sparks to trap opponents) and the effect was theorically strong enough to make the player deviate from it’s main goal: the goat. This is a good asset yet? Noooo… all those sparks spinning around added confusion and much unwanted difficulty and the stun effect was only frustrating. A bad experience ruins the mood of a player, even if the event lasts a couple of seconds, it may continue to alienate him for a while after. Then came an idea: no environment/level induced harm would result in a stun/paralyzis/points loss, we must find special and interesting punishments. What if instead of paralyzing, the ball would trap the first person it touches inside, leaving it to float along with it? Of course, the player would be able to navigate, but the navigation would be altered (pushing a bubble from the inside instead of normal platforming). This would also allow for a much longer punishment while not really frustrating the player. Trying it, the mood already improved, but still, something was off: no matter the reward, those with little experience could care less to hit a ball when there is the point-giving goat running right next to them, so it became only an hindering assets for newcomers, something that would turn them off because they would fall victim of the ball often and never really use it. So our conclusion was that the ball should not be kicked to be a threat. It basically became a level asset that moves around and tries to trap you into it. This design ensures that the advanced players don’t have the edge of using them as weapons, but still they have the advantage of beign more aware of them and can avoid them more easily. After debates that lasted for wayyy too long, we finally came to the conclusion that no level asset should be simply hindering, in some ways one would want to be affected by the asset to his advantage in certain situations as much as trying to affect the other totos with the same asset in other situations. So any assets that produces a clear disadvantage no matter the situation will not be included. This includes any type of sustained stun or crippling in any way. One other thing about the bubble is that it would be placed in locations where it could create ambiguity, like when the bubble is placed in a narrow passage where there is barely room for a toto to pass by, you begin to wonder if you can, or you cannot, if the risk is worth it, if there is another way to reach destination, and as the result of being caught must not be too crippling, many would just try to go through and be caught. All this thought process is rather demanding and a little bit uncomfortable when playing toto temple, so we try to be as clear as possible when a way is barred. We had other ideas in mind, like a level in which the lava builds up, and eventually totos would have to kind of work together to press buttons to purge it while it wipes the arena, if you are not in a safe area you are penalized. Lava would make you run like crazy without any way to stop or dash. Touching lava would never be an advantage and it is a long cripple. And less experienced players would just be reallllly confused and they would spend more time on fire than not… frustrating. With that newly acquired wisdom, we devised the final version of the bubble: in a level, acquiring the goat means being stuck in the bubble. The goal itself is to be stuck inside the bubble, then, with alternative controls, trying to keep the goat as long as possible. Also, the lava level now has geysers that makes you dash all the way through the level. The propelling geysers form a definite wall that blocks the whole way, it can be used as a fast traveling system and as a manually activated wall to trick your opponents. Keep the goat as long as possible while swimming as fast as possible in a bubble fish! You can activate the fire bursts by dashing in them or shielding near it, you can fast travel with them or trick your enemies into them and send them far away. Each level has its own feeling, we did not want to make 30 levels that feel alike, with only different layouts, because we think that layout is a really small part of a level design, and anyway in Toto Temple, we can only have so many layouts because the goat carrier won’t trap himself in dead ends, so if there is a dead-end, nobody will go there and the area is useless. So instead each level has its own mechanics that differ in feeling and quirks. For the Player induced level design I talked about at the beginning, we decided to do the mine level, where totos have to dig to get to the goat, then make their way to any goal. 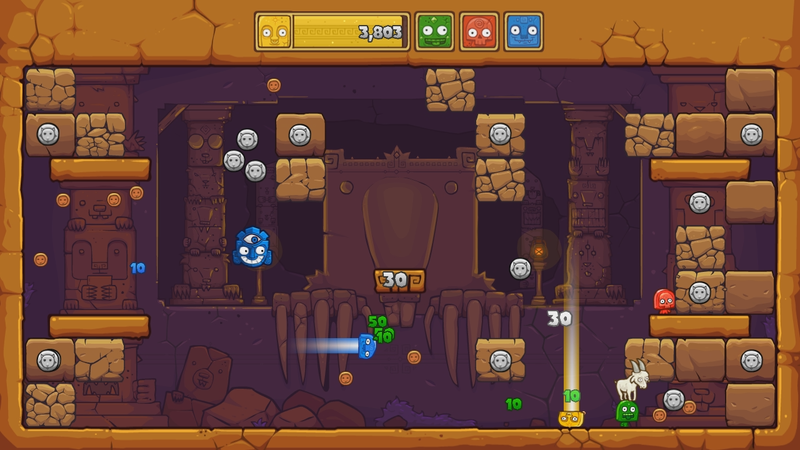 Other two levels only play with collision to trap or isolate totos. If you are isolated and have the goat, you are happy. The tiger level has kind of a trap that opens, let passage and close according to a timeline. The forest level has doors that close themselves behind the totos that go through. In the mine you dig to get the goat, this creates a level layout that differs from game to game and even evolves during a game. In the tiger level, this trap just goes on about its own business until a bad lucked toto happen to pass by and be caught in it, it can also be used to be safe for some time if you get caught when you have the goat. Great opportunity for feints! In the forest level, there are doors that close automatically after a toto have entered, so they are kind of a go-to direction when you have the goat and you are chased, it switches and encloses the action from one side of the level to the other. The fact that Toto Temple does not deal with elimination forces us to develop new ways to think to make the experience as varied, rewarding and engaging as possible. Furthermore, being an unknown game, we need to be able to hook new players into digging deeper in the game, so we need interesting challenges for advanced players that would appeal to less advanced ones. This led us to one golden rule: “no asset must be a purely offensive weapon or obstacle”. 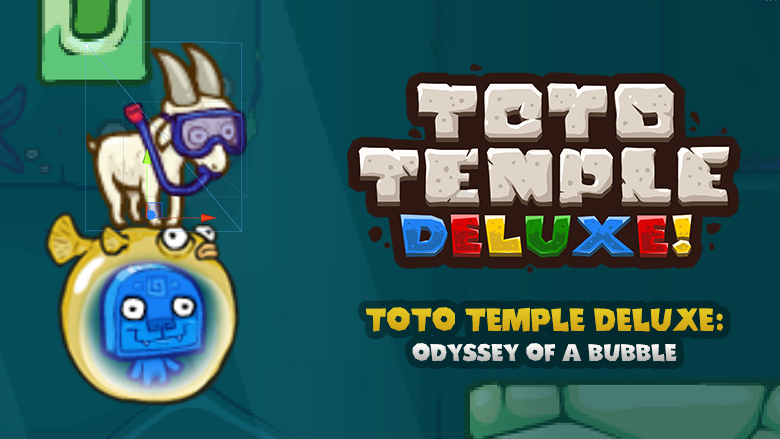 We still have several ideas for new level designs in store, some of them will be released some time in the future, in the mean time, here is a challenge: can you come up with a level design or an asset idea for Toto Temple? I have an idea, a map that’s shaped like a goat’s head. Nice start! But as I said, changing layout/thematic is not enough, we need a special mechanic with it to have a new level. Haha, but there is no death in Toto Temple, what would being hit by a lazerbeam do? being hit by a lazer beam wolud shrink you. being hit by a lazer beam wolud remove a bunch of points or the goat. 1.-occupied unity or flash for game toto temple? 2. programming to animate the characters occupy? 3. use adobe flash to illustrate? 1. We use Unity to make Toto Temple, with flash we never could get it to run on Ouya, that is for sure. 2-3. Don’t know what you mean, but if you ask what program we use for the character animations, all illustration and animation is in Flash. We also make the simple animations like screens coming in and out of screen in Unity with tweens. What program used for this video? adobe flash and after effects? Beau travail de rétrospective sur le ”pourquoi as tu fais cela”. J’adore vraiment ce jeux mais j’aimerais y jouez sur PC dans le futur !! Lâchez pas votre bon boulot les connes. Vos articles sont toujours très intéressant, c’est généreux de votre part! Je ne suis pas inquiet que vous trouverez de quoi m’impressionner encore lors de votre prochaine mise à jour de Toto Temple 😉 lâchez pas gang! Pour le défi, si j’avais à proposer un prototype vite de même, j’essayerais un niveau minimaliste (quatre gros blocs centrés peut-être) dans lequel chaque toto créerait un mur derrière lui de sa couleur lors d’un ‘dash’. En bref, j’adapterais le jeu QBasic Nibbles (ostie que je suis vieux, je sais) ou encore Tron (les motos qui tracent un mur dans le but d’y voir son ennemi y entrer en collision). Biensûr le mur devrait probablement être de longueur fixe et à chaque fois le précédent devrait disparaître. Sinon peut-être seulement le porteur de la chèvre possède ce pouvoir question de créer des obstacles aux autres? This is actually pretty imaginative and in line with the philosophy! I’ll be sure to give this one more thought! (several seconds later, thinking about it) hmm there seems to be a problem with this as everyone would chase the goat and it would become impossible/not fun to navigate near the goat carrier. Imagine 3 players spawning walls behind them as they approach the goat carrier, they would make quite a mess of blocks around and over him. As for the goat carrier, it would make pretty uneven lines even if we follow a grid, but that wouldn’t stop us from doing it. Some might just exploit this and just builds a fortress in which they would never exit. A variant would be to be able to break these blocks like in the mine or make each block last a short while, so no obvious exploit can be made. Maybe we could transform this mechanic into a powerup, it looks like it could empower one quite a bit. Definitively worth a look! (several seconds later) Oh wait… before we can begin to think about this, we should look into the problem of ambiguity in navigation. We don’t have any place in our maps where there are 1 block high passages because it would be ambiguous and not let you pass through if you are big. Although there seem to be problems with the implementation, I am genuinely impressed and excited about this idea and it shall be the starting point of a brainstorm we do in the near future!